My rug loom now lives in a cage. It used to sit out in the open in my studio, which is actually what would normally be a family room. Then we adopted a four month old cat. 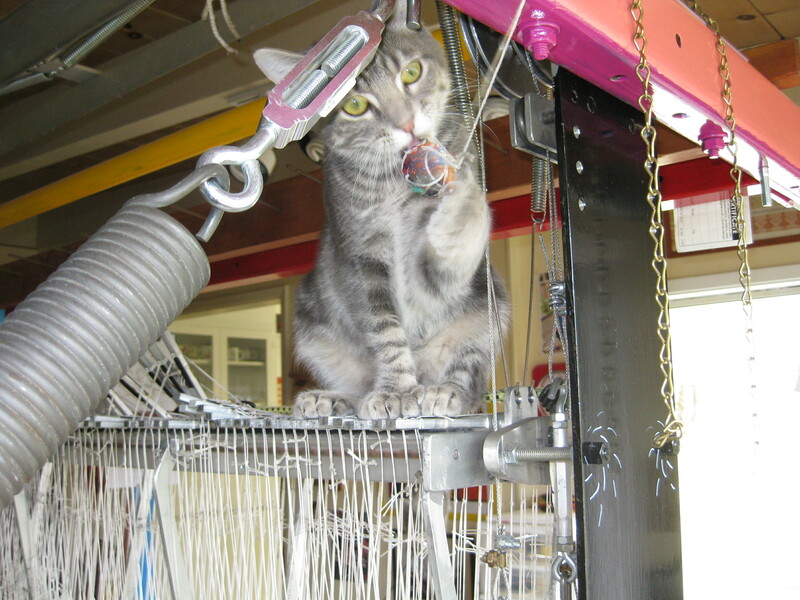 He just could not resist climbing all over the loom and messing with the yarns and the strings that are part of the mechanism of the loom. I would have to go to great lengths to protect the loom when I wasn’t working on it. Nothing I tried really deterred him and I would end up frustrated and mad. Shortly after Nolan the cat came to live with us, we began a big remodel project on our house. The loom got dismantled (no small task) and moved into our small living room. We could at least put a door up to keep him out of there. Part of the renovation was all new walls, ceiling, and flooring in my studio. 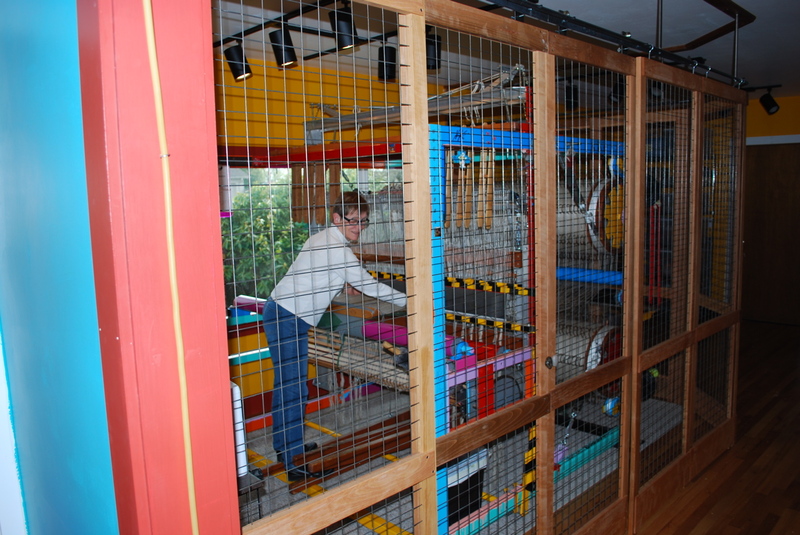 Once the loom got moved back, the contractor had an idea for a cage, and what you see in the photo is what we ended up with. It can all be dismantled when I need to reload the warp beams or, heaven forbid, have to move the loom again. At that time the cat will have to be locked in another room, or he will cause more frustration. You might wonder why we didn’t just install a door into my studio. Being a former family room, it is quite open to the rest of the house. The stairway to Jeff’s new studio is in my space. For the most part, Jeff wants Nolan to be able to go upstairs at will, and closing off my studio would deny access to the stairway. Here is a photo of Nolan when he was still a four month old kitten and before the house renovation and the cage. Where he is perched is definitely a no-no zone. He is now two years old, but hasn’t lost his curiosity about the loom. My sister teased me and said that most people would cage their pet rather than themselves. It’s easier the way we’ve done it. Sometimes Nolan sits outside the cage and whines, but for the most part he is resigned to being excluded from the weaving process. If you are thinking that our cat rules the roost, you are so right! We do love him dearly.